Update:: Agence France-Presse says JKR will be a witness. Firstly, the April 14 trial in the JKR/WB vs. RDR Books case will be a bench trial, meaning that there will be no jury. A witness list is due by April 4. 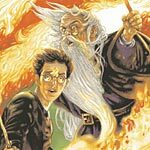 “Do you think that, if Lexicon wins the case, the Harry Potter fansites are going to be affected in any way(Lexicon Online included)? A victory for RDR Books will protect the rights of fans to create based on someone else’s work. If RDR Books loses, copyright holders will be given broad new control over fan activity, control which will allow them to shut down sites, stop authors from writing about their works, etc. So a win for RDR Books is definitely in the best interest of fans who create websites, write fanfiction, make wands, compose wizard rock, and so on. I am surprised how many fans have missed this point. Their freedom to create is on the line here. How many pages does the Lexicon book have? The Lexicon book will have around 400 pages. It’s 160,000 words. The book has four authors. I am the main author, but three of my Lexicon editors worked on the book as well. If the Lexicon is published, once the Scottish Book gets out, will you still update Lexicon Online and Book? I’m as excited to buy Rowling’s Scottish book as anyone! It will be very different from the Lexicon book, with a lot of new and exciting information which only Rowling can provide. I will continue to update the Lexicon website. I love working on the Lexicon and will do so even if I have no staff and even when people don’t read Harry Potter much anymore. Beyond that, I have written another book, called In Search of Harry Potter, which will be published in July. I’m starting on another one as well. I intend this series of books to comprise a complete independent reference library to Harry Potter. The second and third books will not generate the kind of legal concern that the Lexicon book has, thankfully. Do you consider that your fanatism or admiration to J.K. Rowling is less now after all that have happened? And finally, we have a very important and related announcement regarding the status of the Floo Network. The following is an announcement that contains commentary. The interview quoted above contains a number of assessments about J.K. Rowling’s intentions and what the Lexicon case means for fandom as a whole. The comments sat uneasily with many of us as soon as we learned about them, and prompted a discussion among our entire staff about Leaky’s association with the Harry Potter Lexicon, in which it became overwhelmingly clear that Steve’s thoughts on this matter and ours differ so greatly as to be polar opposites; we do not think a win for J.K. Rowling means tighter controls on fan creativity at all, and are concerned for the opposite, as well as the attempt to misportray the issues of the case as stated in sworn affadavits. So, after a few days of careful and many-sided discussion, we, as a full staff, decided that people who have such a fundamental disconnect in beliefs cannot and should not be partners in name or spirit, and two days ago informed the Lexicon that we are severing our association. There were many who called for this since the day the lawsuit was filed, and on many occasions since, but we decided to wait to make the final decision until we were able to shake out more about the case and the beliefs of the parties involved. Now that it has been made clear to us that the Lexicon’s leader and we disconnect on such a fundamental level regarding fandom, it would be disingenuous to continue calling ourselves partners. We had intended not to make this decision until the case was completed, so as to not sway public opinion. The comments in question, however, combined with the suit’s history and revelations therein, make us too uneasy to continue affiliation for a moment longer. We had also wanted to refrain from offering commentary on the case, but we all agree that if it meant the continued propagation of comments against our beliefs by someone so visibly associated with us, silence could not be maintained. That it was a fully supported decision doesn’t mean it wasn’t very hard for this staff, who have for so long considered the Lexicon an ally in all things. The staff was sobered and saddened to find itself walking so uniformly toward this decision, even knowing it was the right one. We have enjoyed an excellent five years as a member of the Floo Network, and don’t regret that time for a moment. We wish everyone associated with the Lexicon health and happiness in the future. We plan to retain strong affiliations with Accio Quote, though how it would manifest depends on some future decisionmaking, as things are slightly upended right now. This decision in no way affects the regard and admiration we continue to have for Lisa Bunker and her staff, or for Belinda Hobbs and the work she has done on the main Floo page; we hope to remain closely associated with them and their sites. In addition we strenuously discourage anyone from taking frustration for this decision out on any associated staff members, of the Lexicon or any other site. This was not a decision based on hate and hurt, it was rooted in the sad realization that we are much too different now to remain partners. As for what this means, more functionally: This essentially means the Floo Network has been dismantled, as the network would be, then, Leaky projects and Accio Quote, and that’s more a partnership than a network. (We will sort out what to do with the main Floo page, and its content, as well.) There have been many asking, since November, whether Steve would return to PotterCast: That answer is now no. And while Leaky has always owned the hp-lexicon.org domain and paid for the site’s hosting, we’ve promised to transfer the domain to Steve as soon as litigation is complete (a stipulation that would not have been made had ownership not been mentioned in court documents). We will continue to pay for hosting and provide free support until that day. This has been very emotional and trying for the staff here so we hope you’ll forgive our little foray into the commentary area. Since people are by nature opinionated, and we are all human, we wanted to keep the personal opinions we all have separate from the pages here, which is why after the first few weeks of figuring out what was going on with this case, we began to stick to linking to and summarizing court documents and other publicly available pieces, and trying to ask further questions to clear up misconceptions when they occurred. The rationale there is that if it’s publicly available there’s an easy check on its accuracy, and goodness knows our users are nothing if not close readers. We have been mentioned time and again in these proceedings, which makes us involved to a certain, small extent; therefore the coverage will continue to be simple linking-to and explaining-in-layman’s-terms legal documents, so you can easily read them yourself if there’s ever any doubt what we say is true. That said, we don’t expect any significant public documents until reports start surfacing of the April 14 trial; there might be a few article updates and more interviews, but mostly we are waiting for the courtroom proceedings to occur. As usual, we’ll keep you updated to the best of our ability. Thank you for understanding, and as always, we thank you in advance for your civility and respect to each other in the comments.